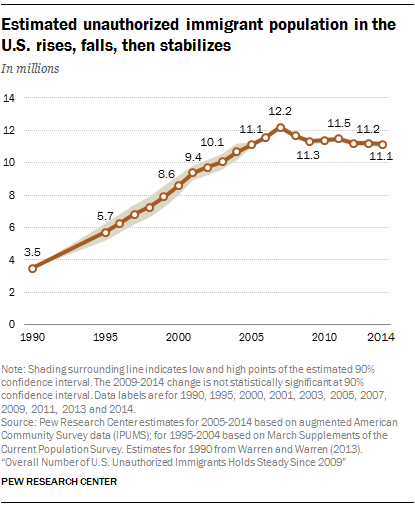 Pew estimated that the number of unauthorized foreigners doubled between 1995 and 2005 to over 11 million, peaked at over 12 million in 2007, and fell to 11 million in 2014. The number of unauthorized workers doubled between 1995 and 2005 to over seven million, and has stabilized at eight million in recent years. Over 70 percent of unauthorized foreigners in the US are in the labor force.